Fitness trackers have become more feature-packed over the last few years, with heart rate analysis, sleep monitoring and GPS activity tracking all becoming device staples. But despite the fitness tracker offering more for the everyday user than ever before, the next step is unknown. Many companies are being undercut by budget options from the likes of Xiaomi, while most smartwatches now pack in those same fitness tracking features. Looking to change that, though, is the Aura Band – a wearable that is bringing something a little bit different to the world of fitness tracking. Instead of the basic step counting, calorie logging wearables that have flooded the space, Aura instead will focus on providing data around body composition and hydration. You'll still get your heart rate tracking, sleep monitoring and activity analysis, but the $89 Aura Band, which is back on Kickstarter after being delayed late last year, looks set to give users more for their money than the rest of the market. "We started with the idea for the device around April 2016. It was all based off the university research of one of our co-founders, and we decided to make a company and bring it to life," Aura Devices' CEO Stas Gorbunov told us. "We thought a lot about the form factor at that time, and we just believed that a fitness tracker was the most convenient for us to build the technology into. The market is very crowded and a lot of trackers [are] aimed at a very general crowd, but we hope that tracking different things will help us to stand out." That key difference here is something Aura Devices calls bioimpedance analysis, which essentially involves the stainless steel Band reading your body in order to ascertain percentage levels of fat, muscle, body water and minerals. Users simply have to make a loop with their hands around the Band, tap the device twice and hold for a few seconds. This, in turn, creates a low-voltage electrical signal for an active and reactive measurement of the resistance of your tissues. Once this is paired with some basic info, like your age, gender and weight, Aura is then able to determine the composition of your body and hydration data. Using these figures and by looking at your activity, it'll even give you a reminder to drink when your body hydration levels are wilting. As Gorbunov told us, the Band is able to do this in real-time thanks to a nine-axis motion sensor, which also pairs up with a dedicated body composition processor and the company's own software smarts. Think of it as offering much of the same features as a smart scale, but right on your wrist. But why has nobody done it before? Well, Gorbunov believes that the data being tracked by the Band isn't for everyone. "There are a bunch of startups [involved with biometric wearables], but not a lot of big guys, and in terms of offering composition and hydration data right now, we're the only one. And I think it's because it's pretty specific, this kind of technology is only relevant to athletes and not necessarily those looking for general progress," he said. "We thought about making it appeal to more people, but our first target is definitely people who are athletes or people interested in strength training – that kind of area." Backing up the bioimpendence analysis, as we mentioned earlier, are heart rate monitoring and sleep tracking. The latter acts in a similar way to trackers from the likes of Fitbit and Garmin, taking movements and heart readings during sleep in order to work out how long each user spends in light, deep and REM sleep (though REM will oddly only be available as a stretch goal). Activity tracking is also automatically picked up through the same nine-axis sensor packed inside, with the Aura Band algorithm able to tell the difference between the likes of running, cycling and strength training. Of course, the heart rate monitor is working continuously throughout exercise, though the red light optical sensor (which can penetrate more deeply and provide better accuracy than green light technology) will also limit this to taking readings every 15 minutes during sleep. What's more, all the tracked elements are available to integrate with Apple Health and Google Fit through the companion app, while Strava, MyFitnessPal and Runtastic are set to come further down the line. The Aura Band is an intriguing campaign, given the fact it's offering something completely fresh on the fitness tracker scene. The biggest factor to consider, of course, is whether you trust the startup's ability to accurately provide you with data that's comparable to the medical grade equipment it's tested itself against. Gorbunov notes that the testing process has encompassed much of the company's time since beginning two years ago, and says that its biggest challenge is to continue providing high levels of accuracy with its bioimpendence data. In terms of shipping, the company is confident it will be able to turn orders around by the projected August rollout, with the manufacturers and distribution chain already in place to begin once the campaign closes. Software, too, is almost there. The Android app is complete and ready to roll with the Band once released, while the iOS version is currently going through the final stages of development. 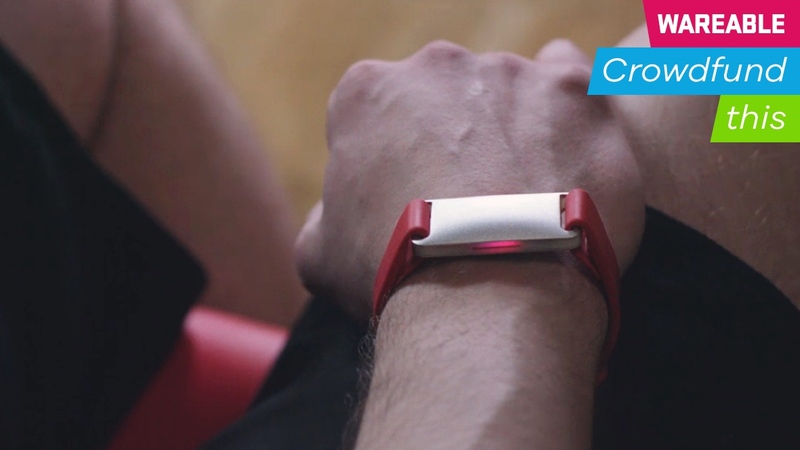 With that in mind, if you can handle the fact that this is relatively new technology, and therefore potentially prone to a few teething issues, the Aura Band looks like a solid project to back if you're looking to get more advanced metrics from your tracker. Just also be aware that Aura isn't the first campaign out there to explore some of this technology, and it would be perhaps the first to do it convincingly. LVL, for example, raised over $1 million back in 2016 and is still yet to produce its wearable hydration tracker due to form factor challenges, so seeing delays here wouldn't be the biggest surprise in the world.